Semtech Corporation (Nasdaq: SMTC), a leading supplier of analog and mixed-signal semiconductors, announced today that Inneos, a leading supplier of optical subsystems, will use its industry leading chipset for quad channel SR optical interconnects for a fiber-optic technology demonstration at the National Association of Broadcasters (NAB) Show on April 18-21 in Semtech’s booth N5024 at the Las Vegas Convention Center. The Inneos technology demonstration, utilizing Semtech’s GN1090 and GN1190, will feature the multiplexing and demultiplexing of four 12G UHD-SDI video streams onto a single 48Gb CWDM fiber optic link in accordance with SMPTE’s proposed ST 297-2 standard for multi-link 1.5G, 3G, 6G and 12G-SDI over CWDM fiber optic connections. The GN1090 is a quad channel transimpedance amplifier (TIA), and the GN1190 is a quad channel vertical cavity surface emitting laser driver. This chipset is designed in leading-edge CMOS technology, enabling industry-leading performance at low power dissipation and with a high level of integration. A full suite of on-chip features minimizes external components and speeds up module hardware and firmware development. 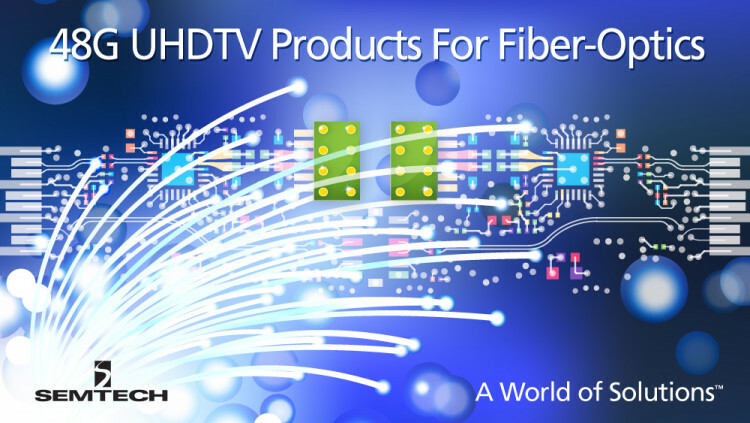 Semtech’s UHD-SDI products feature ultra-low power consumption and provide industry-leading performance at 12Gbps rates. UHD-SDI is ideal for UHDTV infrastructures, including routers, cameras, monitors, switchers and more. It offers pristine image quality, is backwards compatible with existing SDI systems and is standardized by both the Society of Motion Picture and Television Engineers (SMPTE) and the International Telecommunication Union (ITU), simplifying UHDTV infrastructure upgrades and reducing risk for broadcasters. Multi-standard operation: 1Gbps to 14.5Gbps rates for increased design flexibility and a wider range of end-product applications. Highly integrated CMOS chipset with full suite of alarms, monitoring and test features that reduce (or eliminate) the need for an expensive MCU, enable faster time-to-market with reduced need for firmware design and aid in module debug and production test. Advanced feature set: Output pre-emphasis for compensating for long PCB trace lengths, simplifying PCB optimization and input trace equalization to compensate for long input trace lengths. Ultra-high transimpedance gain (GN1090) eliminates need for a post amplifier. GN1090 input sensitivity supports both SR and LR optical links. 48 Gbps (4x12Gb) video on one Multimode fiber. Uncompressed video transmission over 300m distance with enough bandwidth to transmit UHDTV-1 and 4K D-Cinema including High Dynamic Range (HDR) and High Frame Rate (HFR); UHDTV-2 8K60 4:2:2 10-bit; up to 32 x 1.5G-SDI streams, 16 x 3G-SDI streams, 8 x 6G-SDI streams or 4 12G-SDI streams, over a single strand of fiber. The GN1090 and GN1190 are available now. Semtech offers comprehensive design assistance, including field- and factory-based support. Data sheets, volume pricing and delivery quotes, as well as evaluation kits and samples, are available at www.semtech.com/info. Inneos is a Silicon Valley based manufacturer of precision high-speed optical Subsystems. Inneos develops highly-integrated optoelectronic subsystems that help manufacturers expedite delivery of new feature-rich products to the markets they serve. Customers are using Inneos products to create UHD video switches and extenders for HDMI™, Display Port, SDI and DVI. Inneos optical products are based on proprietary technology that combines patented CWDM designs with proprietary manufacturing techniques to deliver high performance in integrated packages. All statements contained herein that are not statements of historical fact, including statements that use the words ”enable,” “will,” “allows,” “provide” and “offers” or other similar words or expressions, that describe Semtech Corporation’s or its management’s future plans, objectives or goals are “forward-looking statements” and are made pursuant to the Safe-Harbor provisions of the Private Securities Litigation Reform Act of 1995, as amended. Such forward-looking statements involve known and unknown risks, uncertainties and other factors that could cause the actual results of Semtech Corporation to be materially different from the historical results and/or from any future results or outcomes expressed or implied by such forward-looking statements. Such factors are further addressed in Semtech Corporation’s annual and quarterly reports, and in other documents or reports, filed with the Securities and Exchange Commission (www.sec.gov) including, without limitation, information under the captions “Management's Discussion and Analysis of Financial Condition and Results of Operations” and “Risk Factors”. Semtech Corporation assumes no obligation to update any forward-looking statements in order to reflect events or circumstances that may arise after the date of this release, except as required by law.